After the events of the last few months, we could have done with a bit of good news - and it is former Destiny's Child singer Beyoncé who has just provided it, telling the world that she is pregnant with twins. 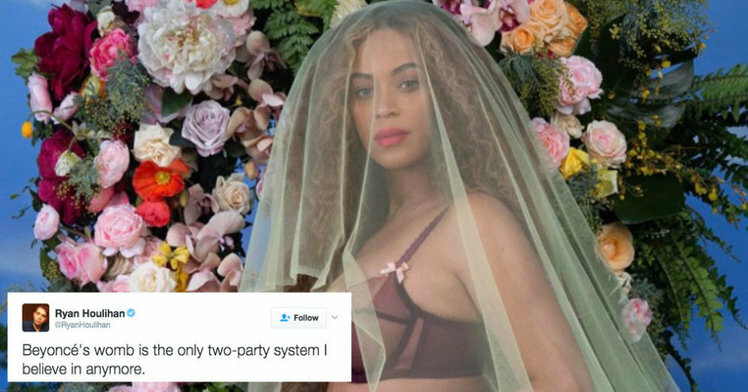 To call the Internet's reaction sensational would be putting it rather mildly, so let's have a look at some of the best responses to the news that Jay Z's wife will soon be adding to her brood. Beyoncé made the news public on her Instagram account, with a photo of herself scantily-clad and already showing - and feeling - the baby bump. She captioned the photo: "We would like to share our love and happiness. We have been blessed two times over. We are incredibly grateful that our family will be growing by two, and we thank you for your well wishes." There was naturally no shortage of delirium - not least because, well, some of us are just obsessed with babies anyway. This woman is a good example. Usually, it seems to be women who are most excited when a celeb reveals their pregnancy. But don't delude yourself into thinking that Beyoncé’s male fans aren't paying attention, and we doubt they'll miss a good opportunity when they see it, judging by this, ahem, utter lad. However, some people did think of the wider implications of the two new little Carters that are on the way. Having given birth to daughter Blue Ivy Carter in 2012, could Beyoncé be preparing her own version of Destiny's Child? It's been suggested, but could be just wishful thinking for those of us who miss the years when the band was here, there and everywhere. As you will remember, Beyoncé was the lead singer of Destiny's Child, where she was joined by... no wait, hang on, who were the other two? Sorry, we can't remember. Kelly... someone? That's the best we can manage. Anyway, maybe the future will include a Destiny's Child II after all. We can see the pregnancy photo itself taking off as well. In fact, it already has, with people rushing to copy the shot. Judging by the memes gathered by this tweeter, men are even keener to replicate the pose than women. We guess that women will have plenty of time to join in when they are actually pregnant. We're sure that Beyoncé’s photo will still be remembered by then. Some people couldn't help noticing that the announcement happened on the first day of Black History Month. Coincidence? Yeah, it probably was, actually. But that didn't stop some people trying to spruce up excitement where it likely wasn't warranted. Bey: We gon tell em on the first of February. Staff: But Bey it's Black History Month.